In 2009 the ban on American newspapers printing images of US Military coffins was lifted (although some had disobeyed this law and gone ahead with printing photos anyway) and although in 2005 when the London Bombings went off the majority of photographs in the papers consisted of bandage-covered walking wounded, there was a hint of what would come; one photograph taken on a camera phone from inside the tube system showing shadowy bodies moving towards the light at the end of the tunnel. September 11, 2001 was the first shift in the times. This was the first time that the Internet and real time media could show what it was capable of - and Twitter was still 5 years away. As live news channels broadcasted the second plane hitting the World Trade Centre millions of people watched from the streets, their homes and offices and no longer were terrible and catastrophic events somewhere over there in the east. They were right here. But as we were able to see more images, streamed live into our homes, through live blogs or eventually from 2006 through Twitter our appetite grew to see things immediately, to experience these horrific events as they are still unfolding and side by side digitally with people on the ground who's fate is not yet known. As I scrolled through the events in Boston on my Twitter feed yesterday evening, having just spent a very enjoyable evening with friends at the British Museum looking around the latest Pompeii exhibition, it struck me just how much things have changed in the last ten years let alone since 2000 years ago. When twelve hours after the initial volcano eruption (an absolute lifetime in today's media cycle), clouds of 400°C gas and ash streamed down from Mount Vesuvius covering the people below they had little warning but yet here I was scrolling through this live event on my phone, sitting in a pub over 3000 miles away reading updates of confusion, hearsay, breaking news bulletins, photographs of the very badly injured, roads covered in blood and explosions freeze-framed to capture the exact moment for all to see. 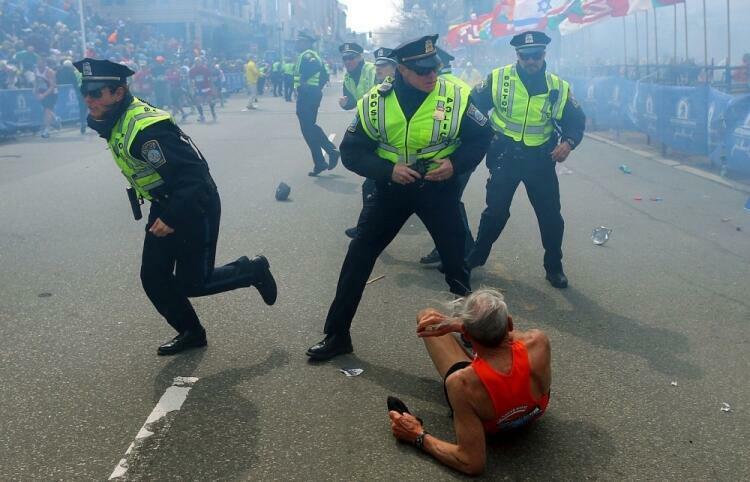 Things have changed yes and maybe it is just the nature of the already high media coverage of Boston Marathon that has caused a skip in the gradient towards us eventually seeing every event in all its detail splashed over the newspapers and on the mainstream Internet. If you look at the pages of the Boston Globe and Buzzfeed [graphic images] you'll see that that day is possibly already here.